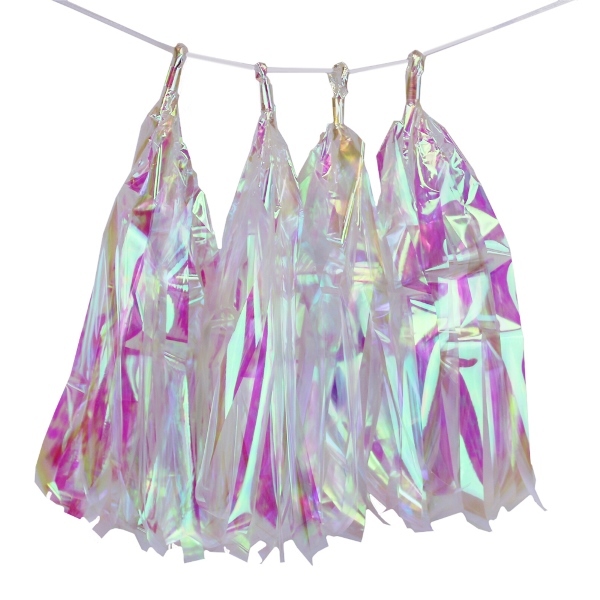 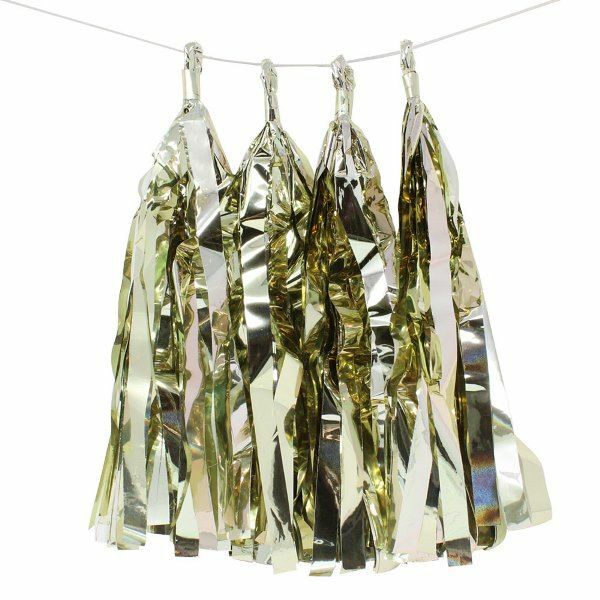 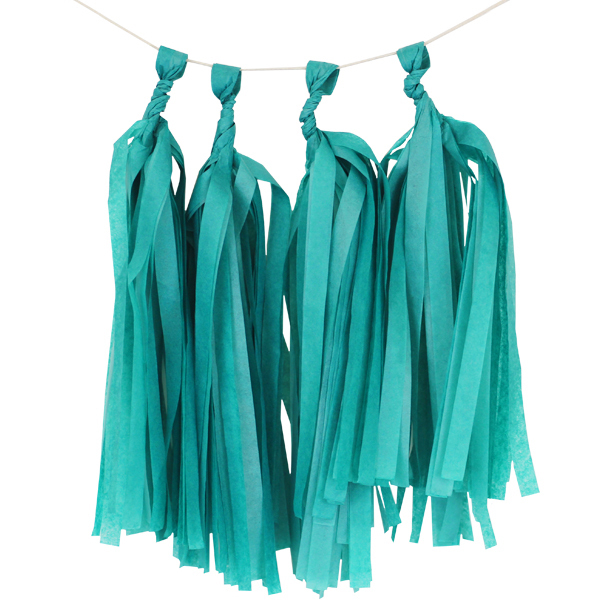 These iridescent tassels are pre-assembled and ready to string into your own garland! 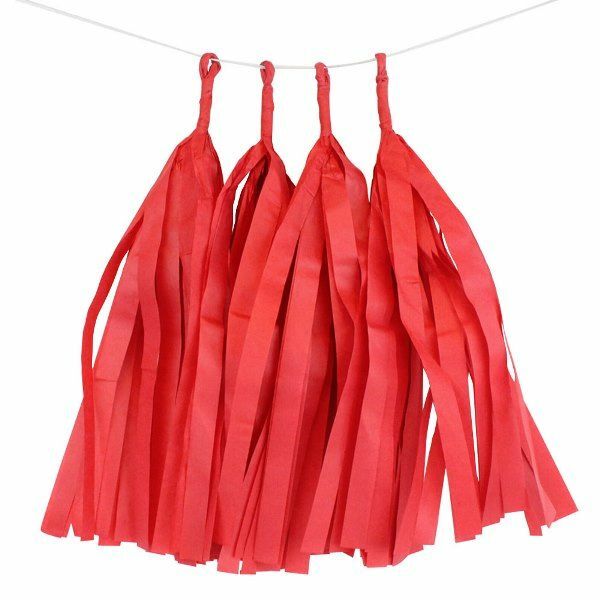 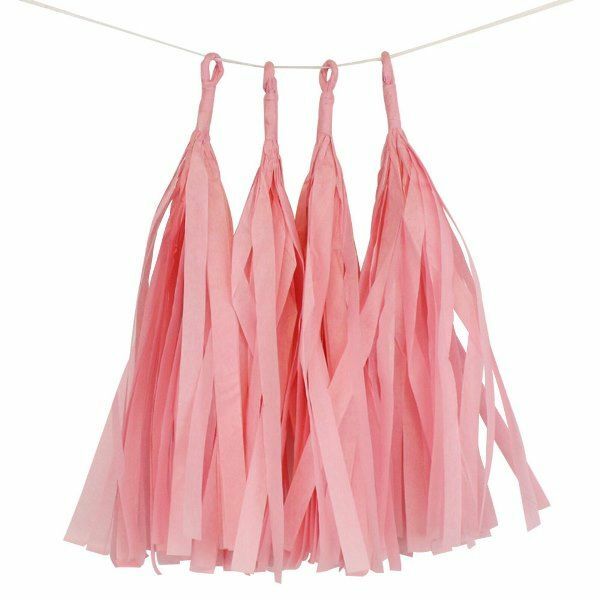 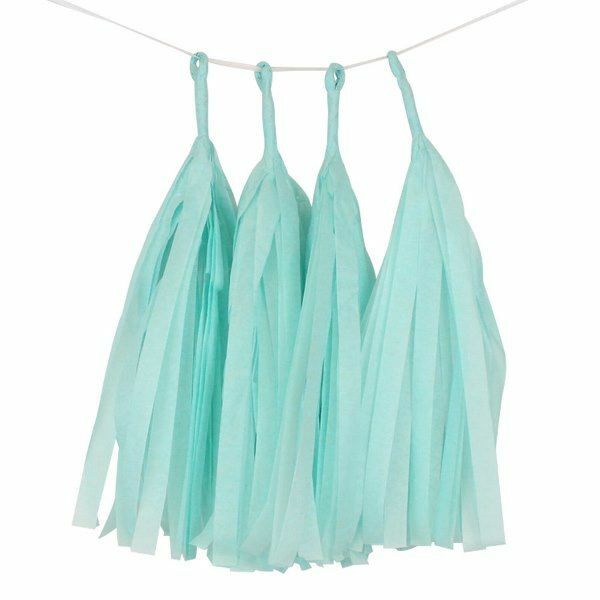 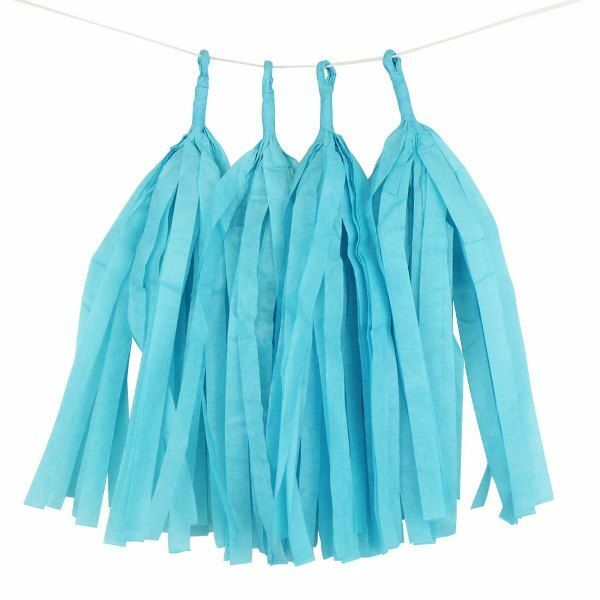 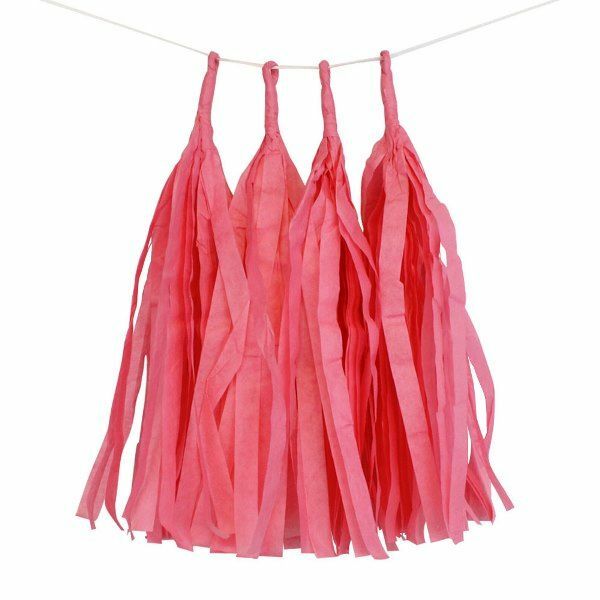 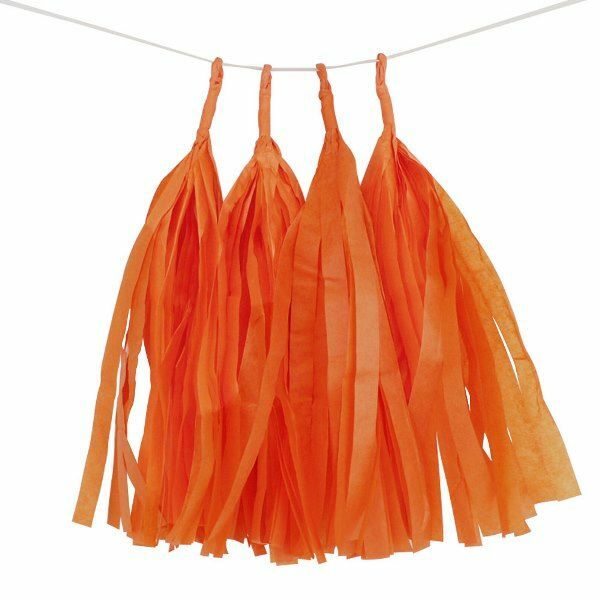 Party tassels are popular for wedding decorations, birthday parties, baby showers and nurseries or anywhere you need a little fun! 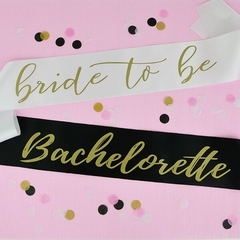 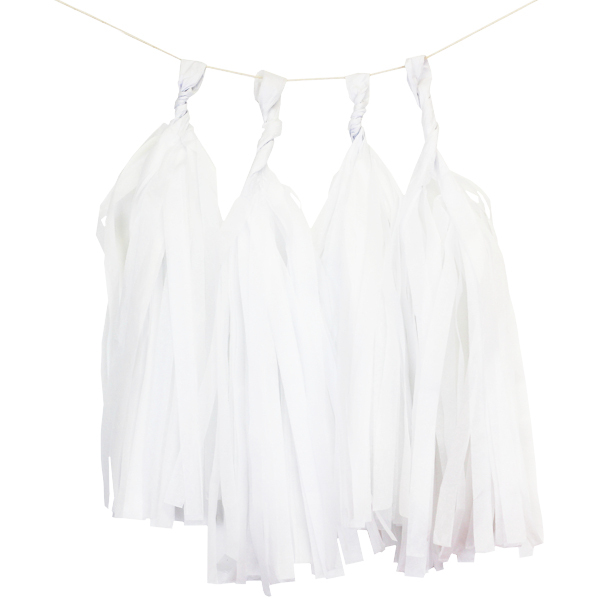 Includes 4 pre-made tassels and a 7.5 foot length of 1/4 inch white satin ribbon to create your own tassel garland. 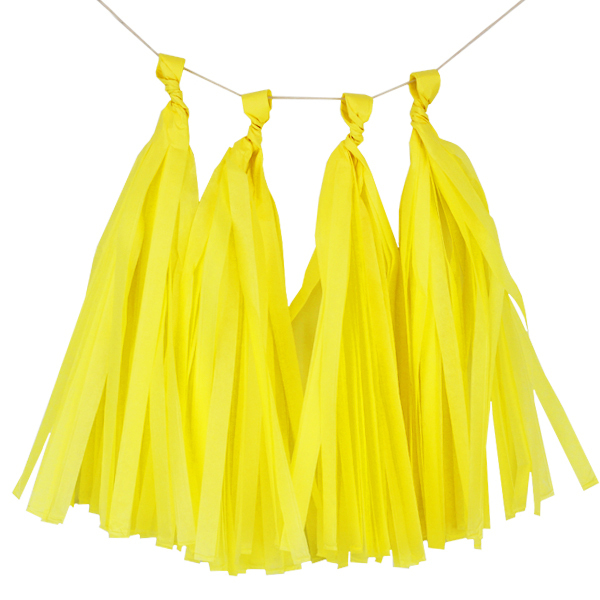 Tassels are appx. 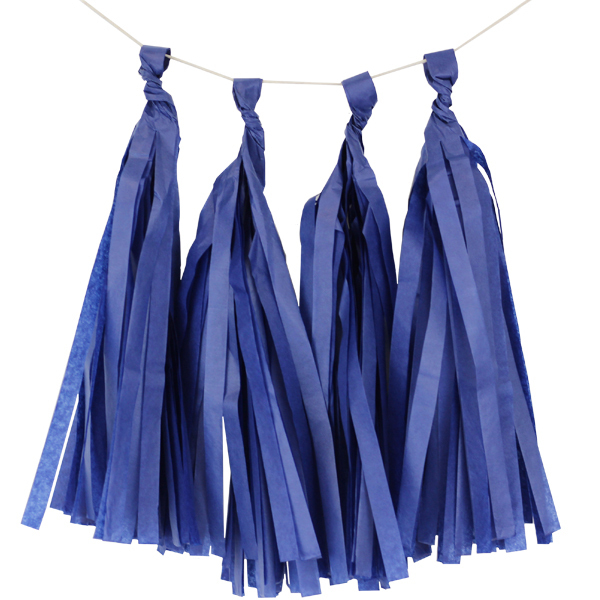 12 inches in length. 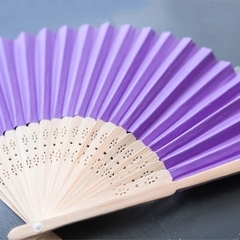 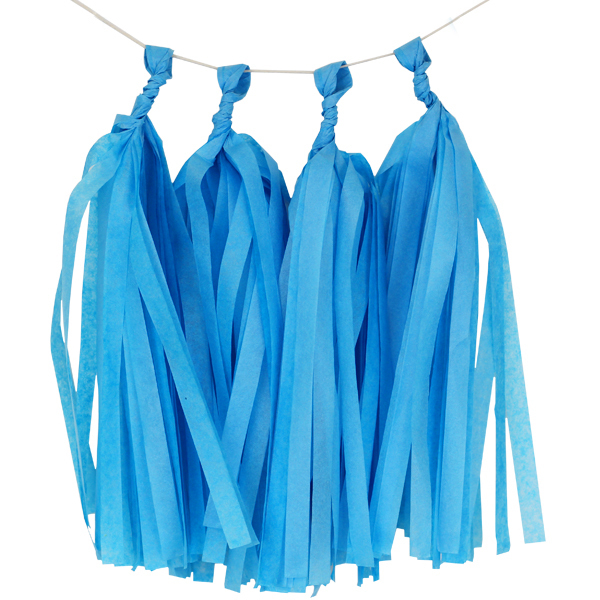 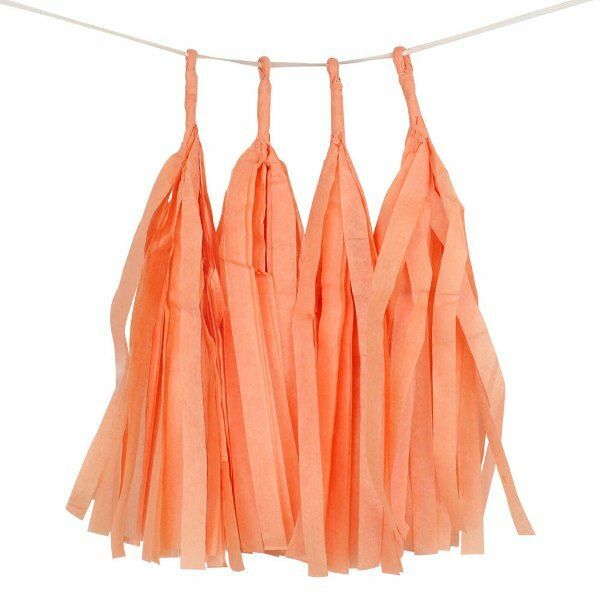 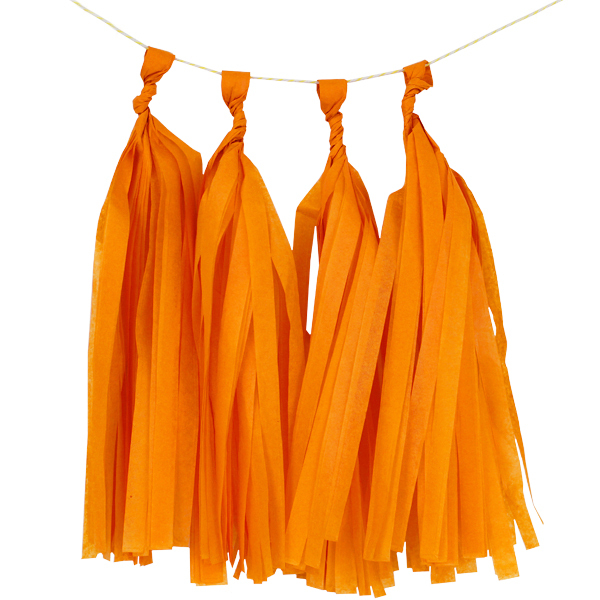 These paper tassels are pre-assembled and ready to string into your own garland! 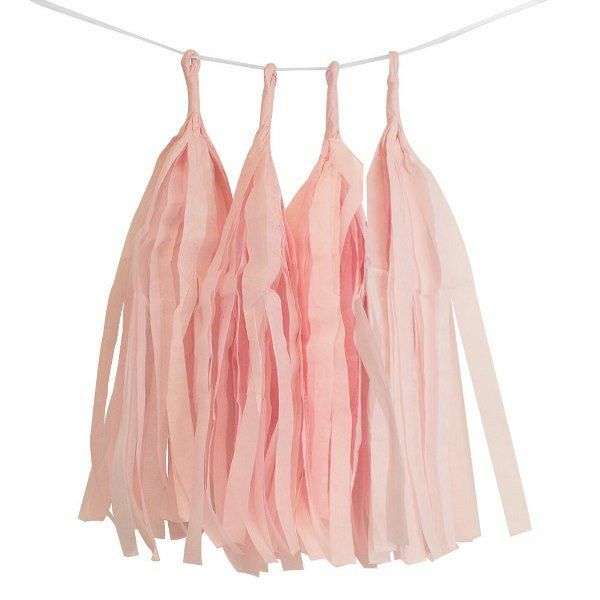 Party tassels are popular for wedding decorations, birthday parties, baby showers and nurseries or anywhere you need a little fun! 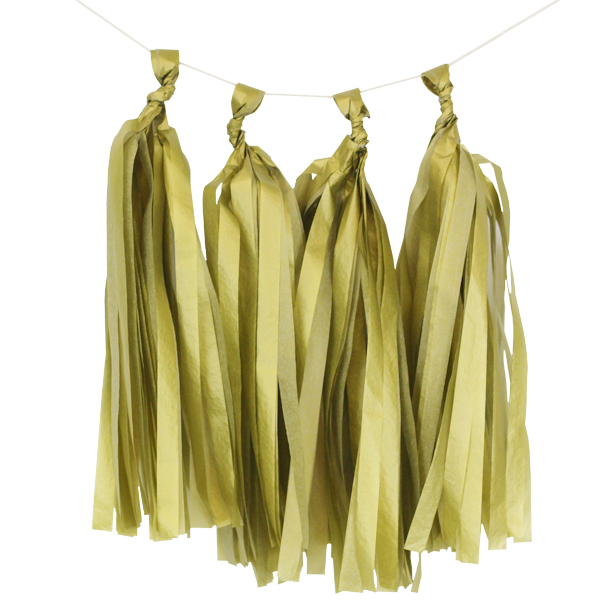 Includes 4 pre-assembled tassels and a approximately 7.5 feet of string to hang your garland.Tassels are appx. 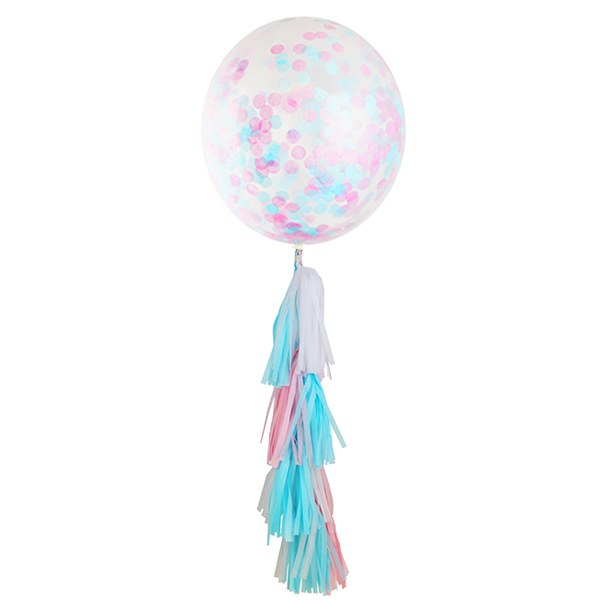 12 inches in length. 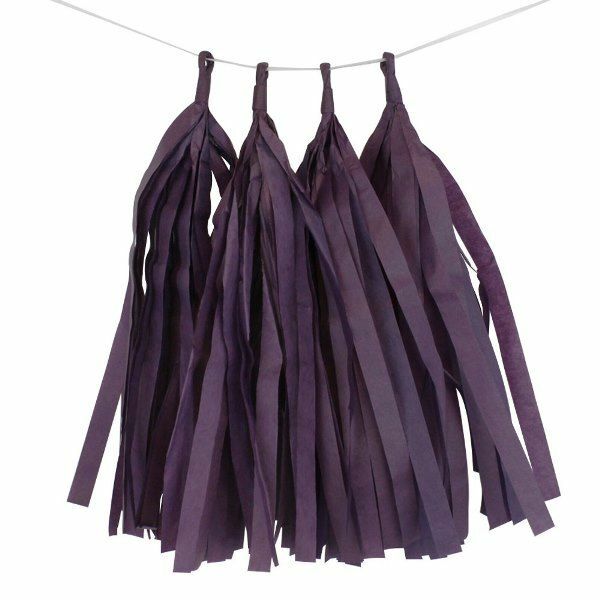 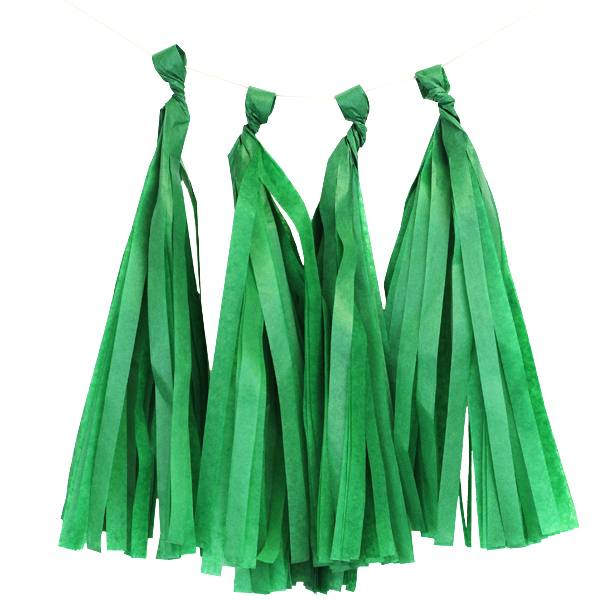 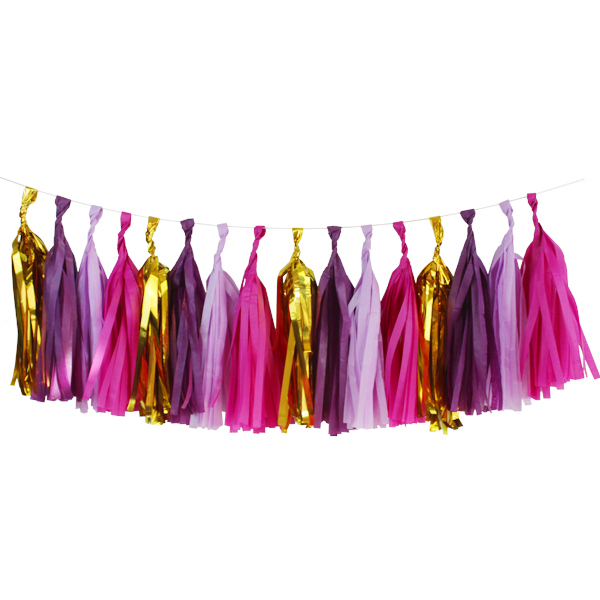 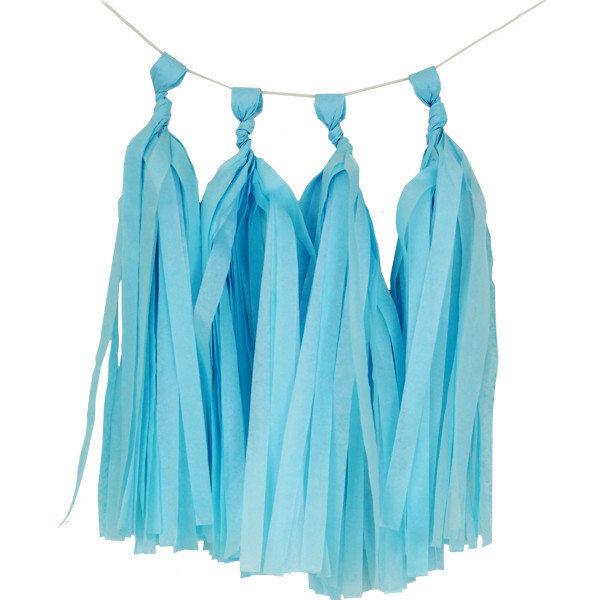 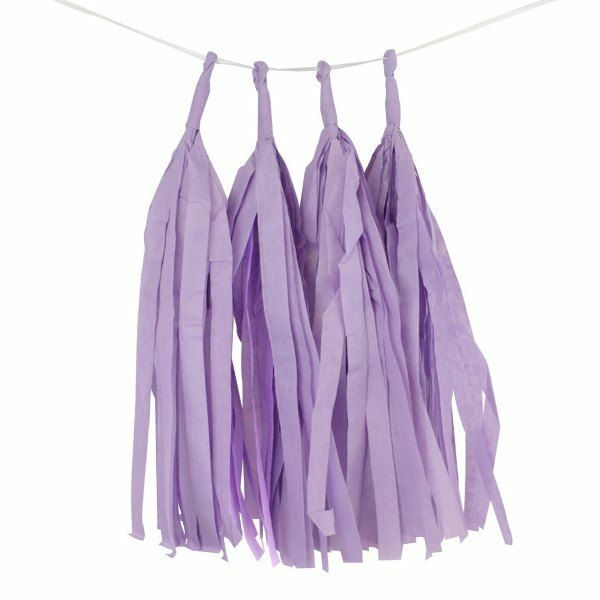 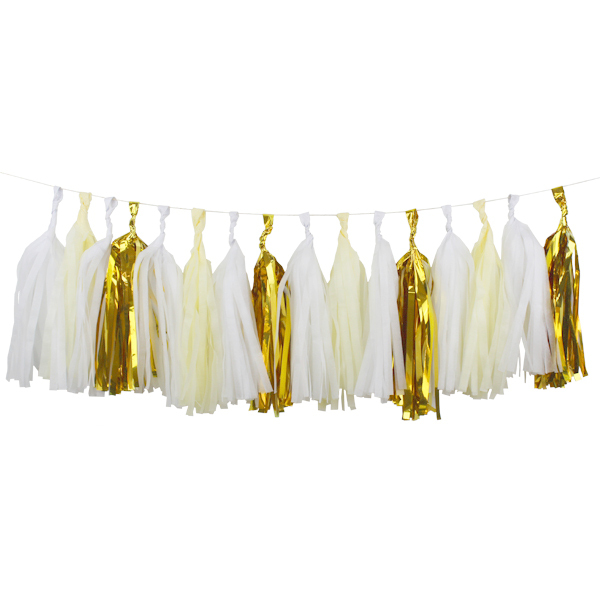 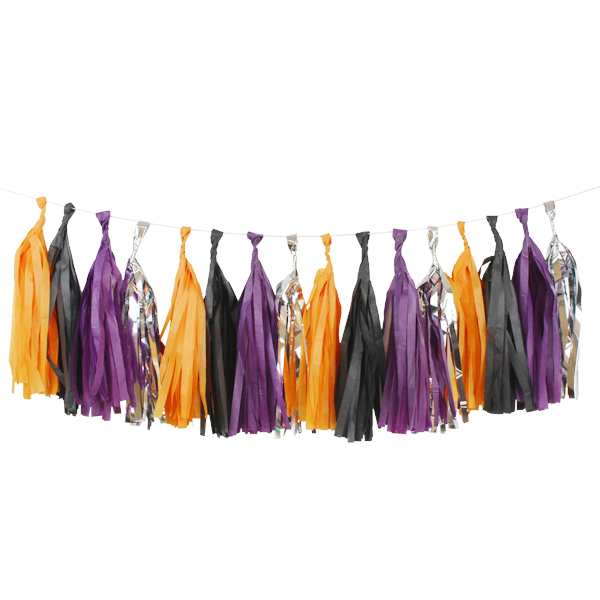 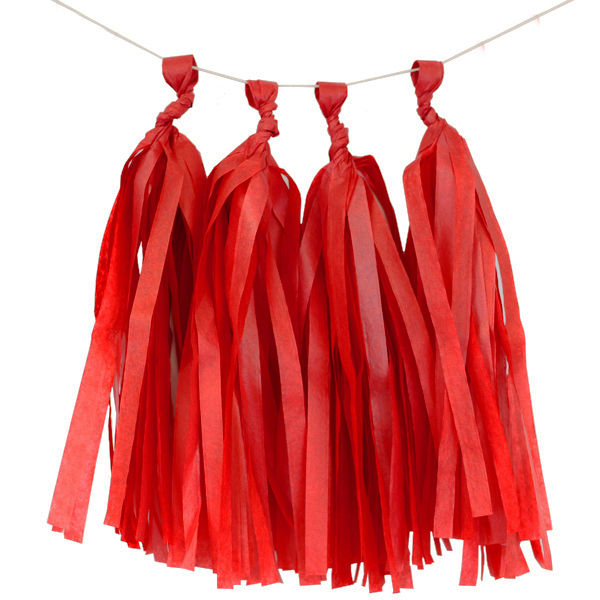 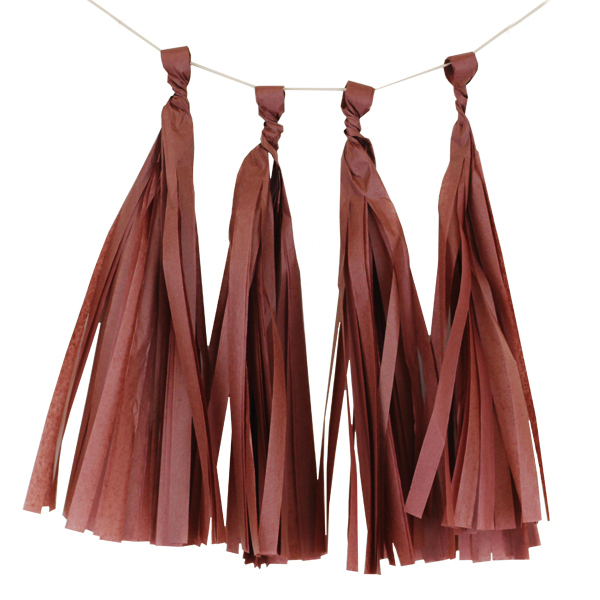 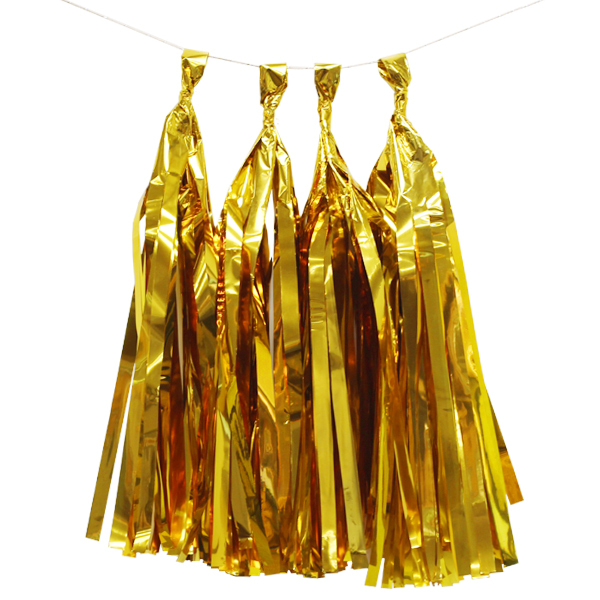 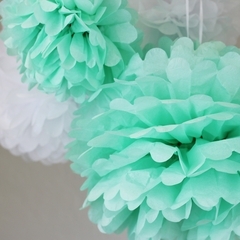 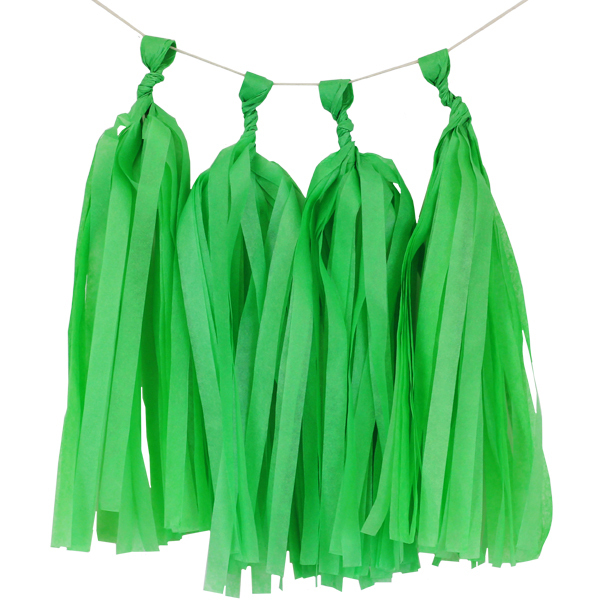 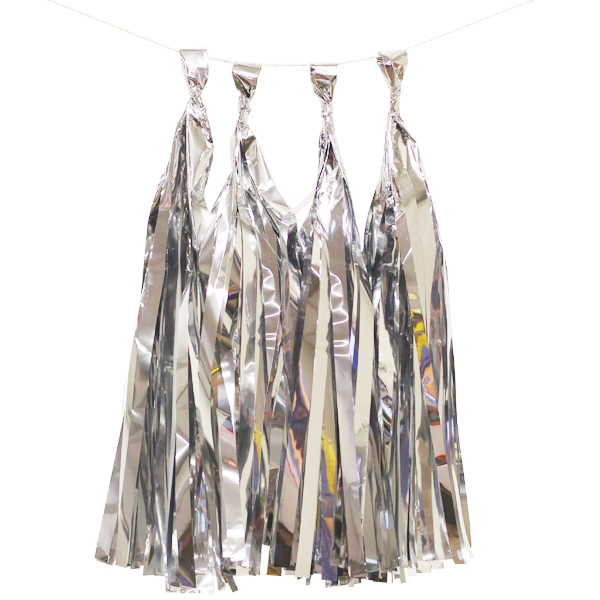 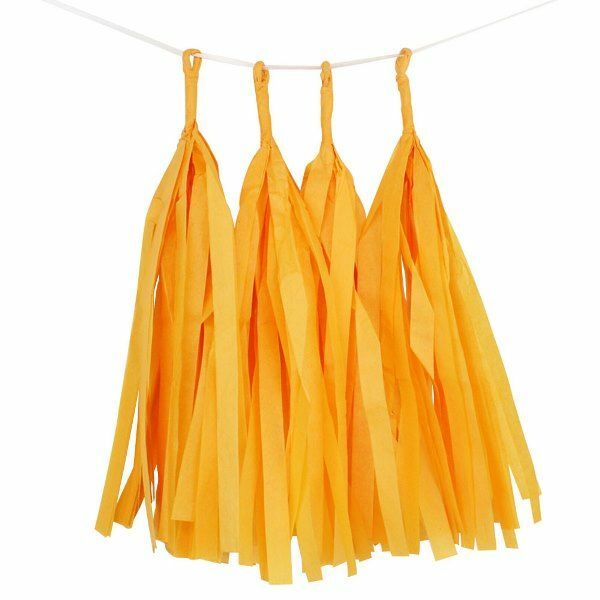 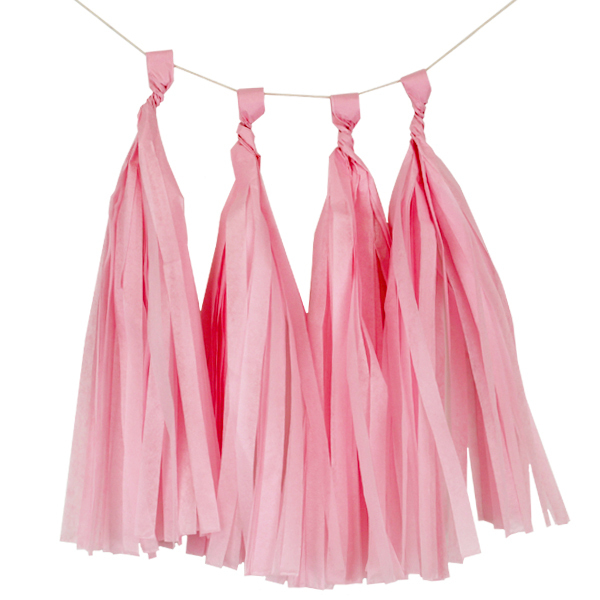 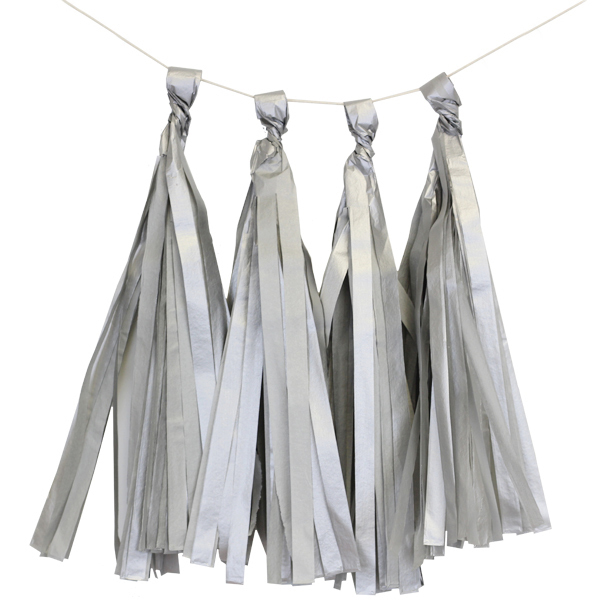 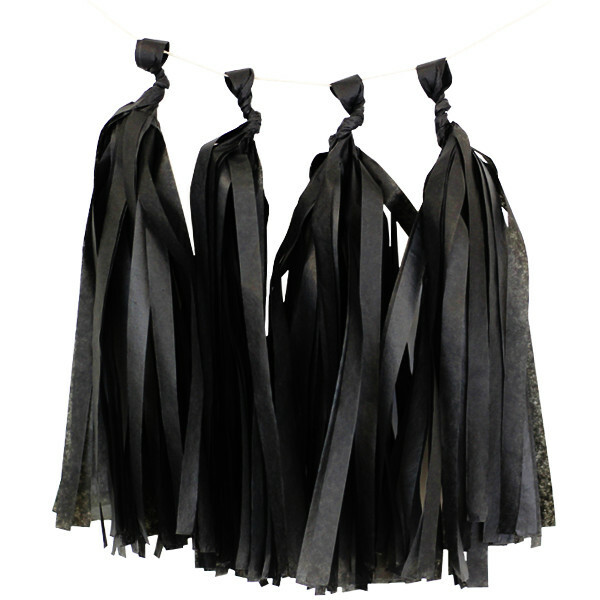 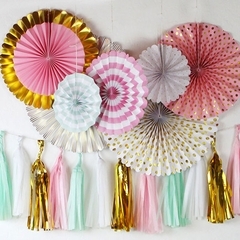 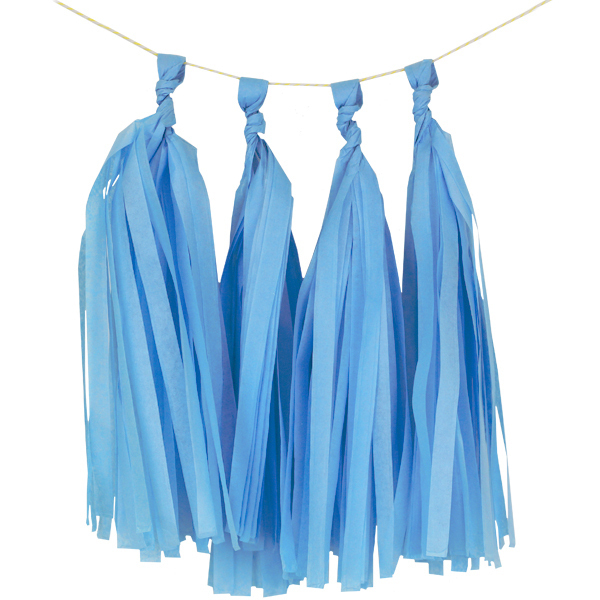 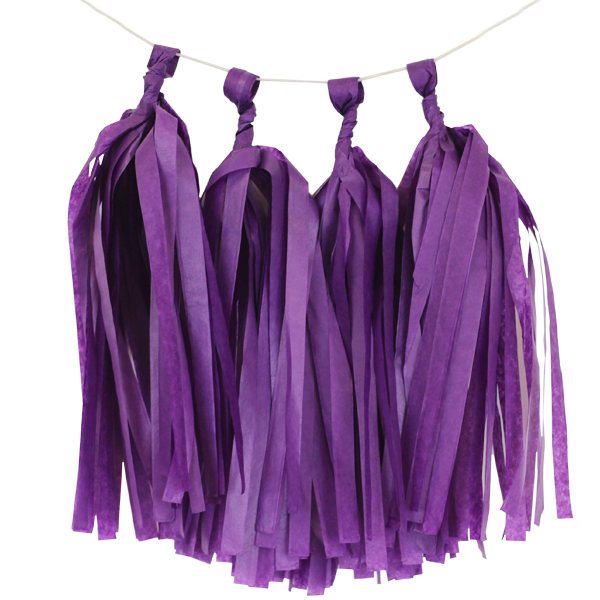 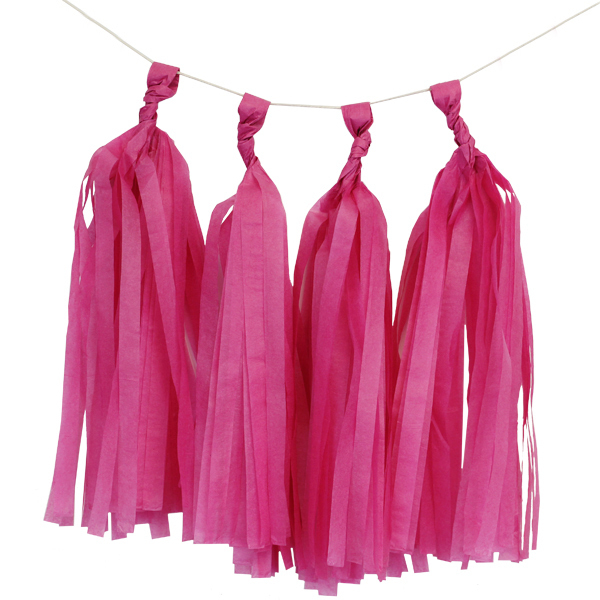 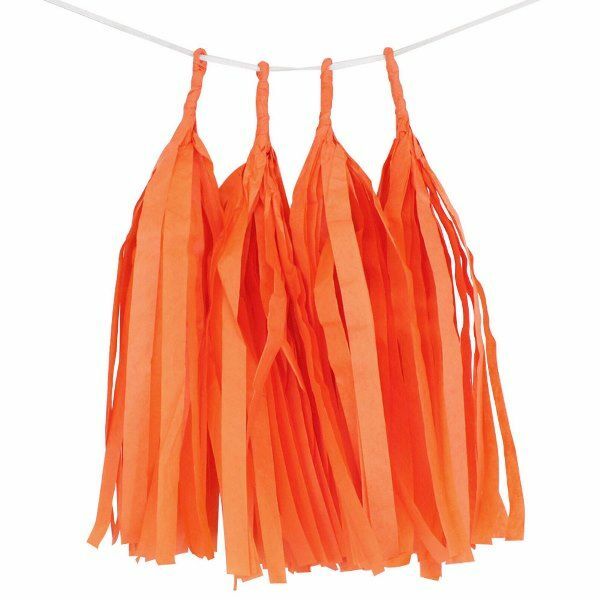 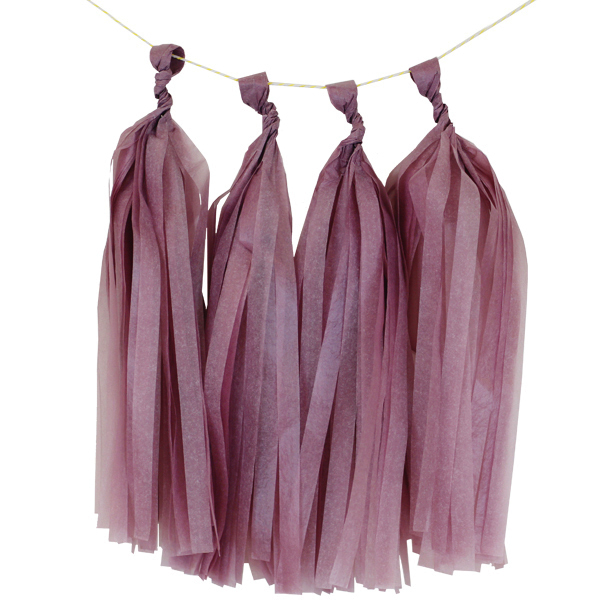 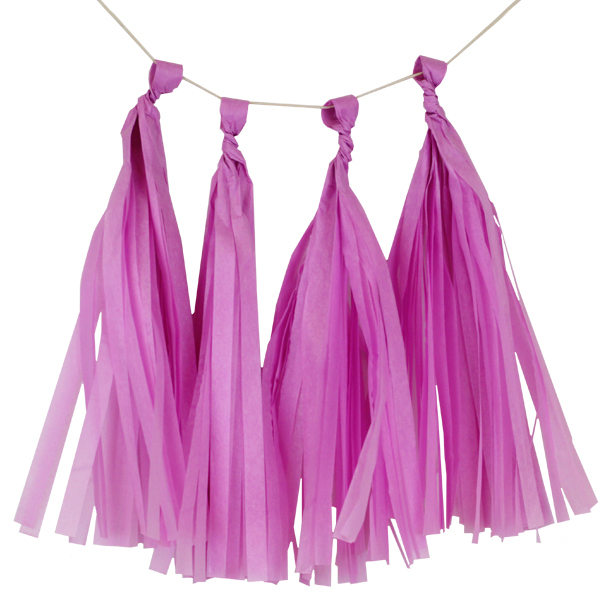 Tissue Paper Tassel Garland is the perfect mix of fringe and flair for any party d�cor. 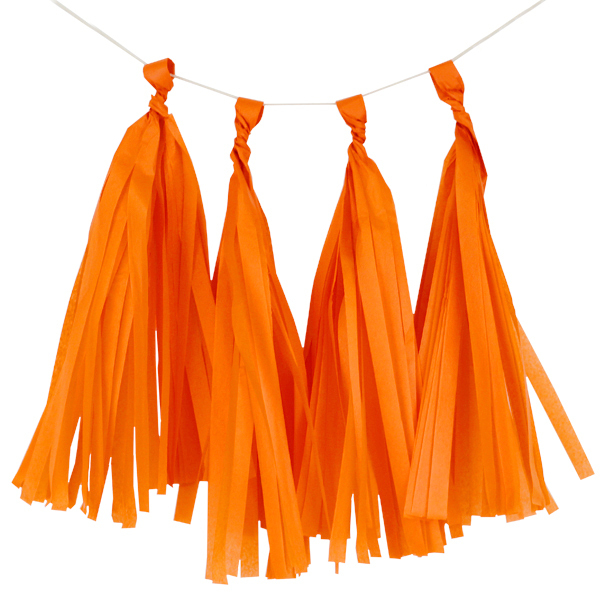 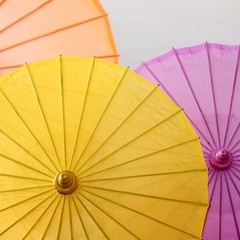 Splash your event with a pop of color and style using tissue tassels. 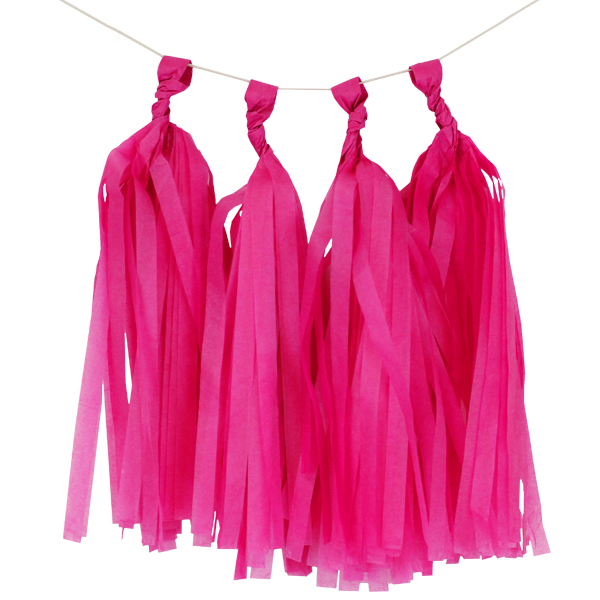 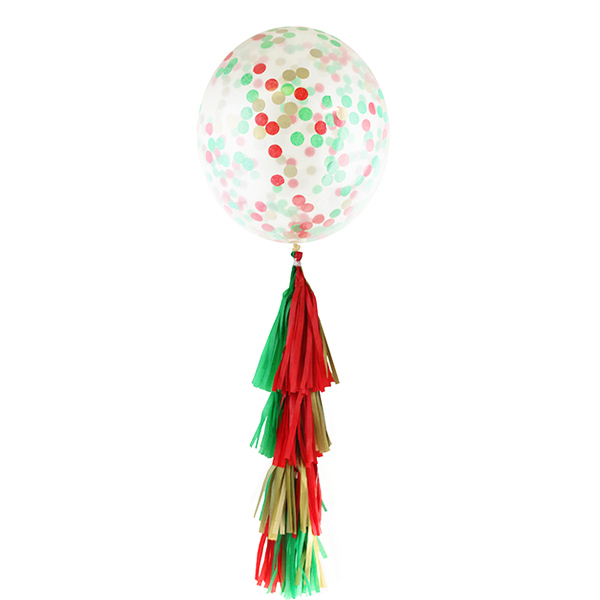 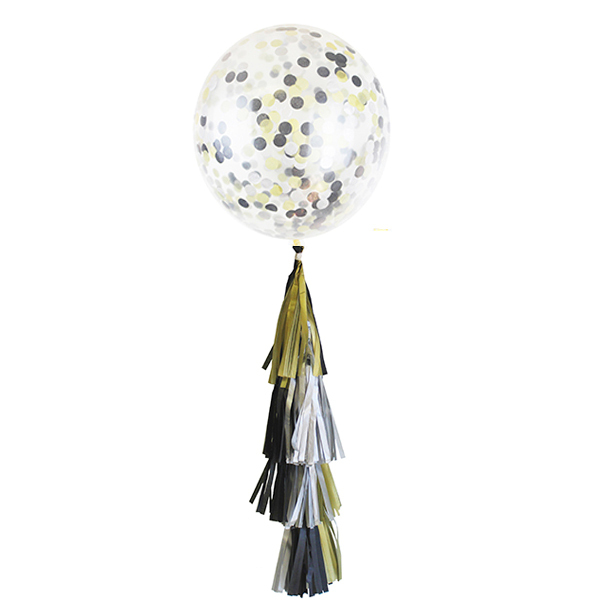 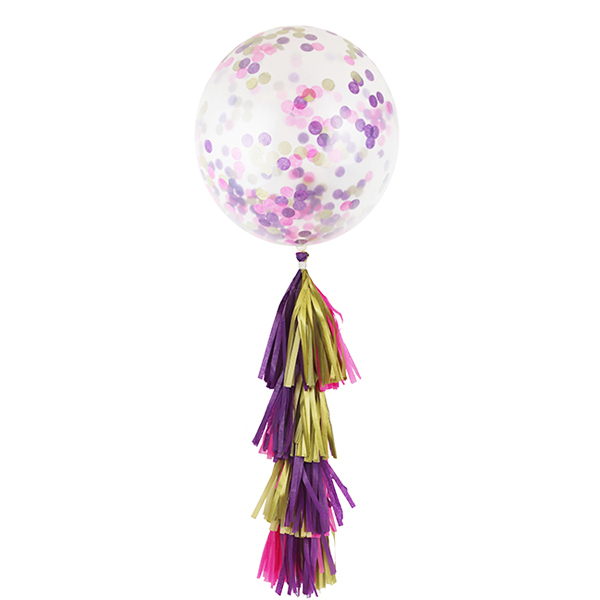 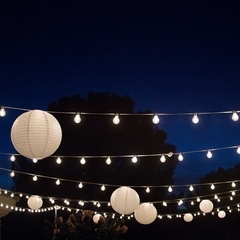 String your tassels together to create a modern garland or dangle from your jumbo round balloons and paper lanterns. 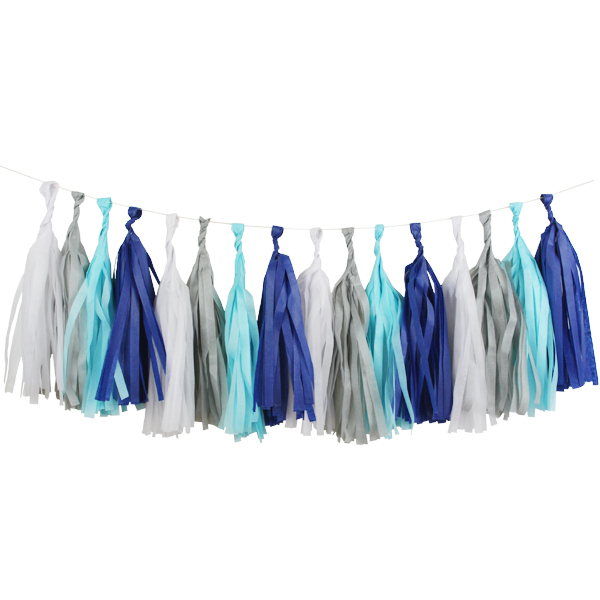 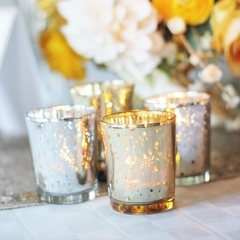 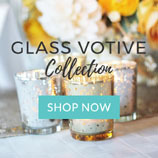 This item is great for birthday parties or baby showers, and can be accompanied with other tissue products. 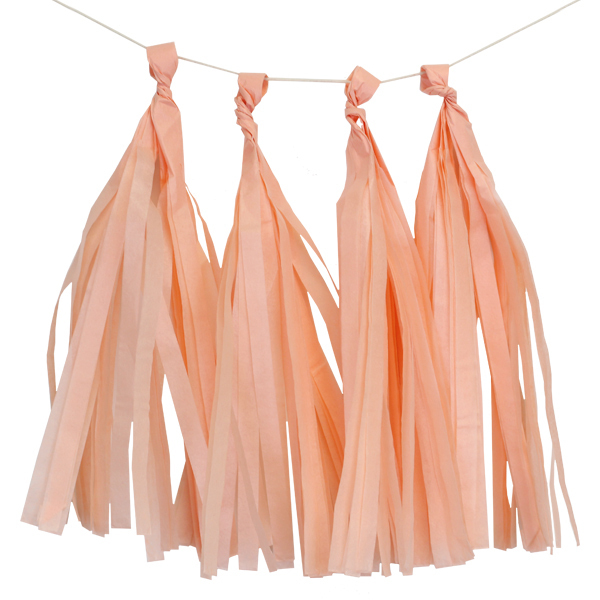 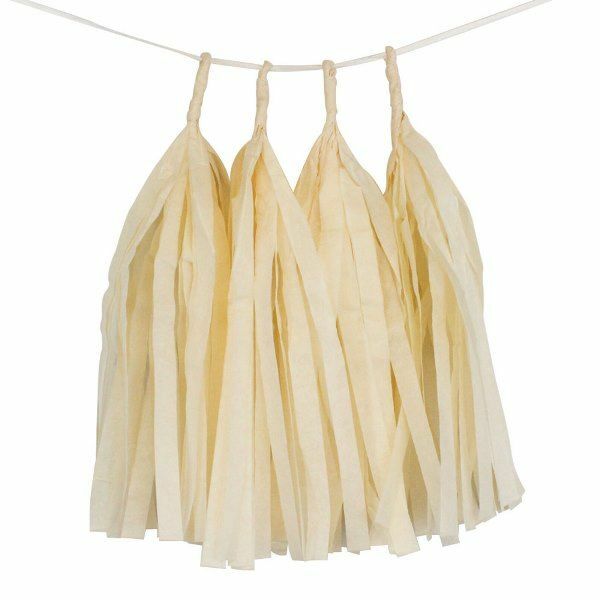 Tissue tassel garland can be hung indoors, or along fences or homes for outdoor events. 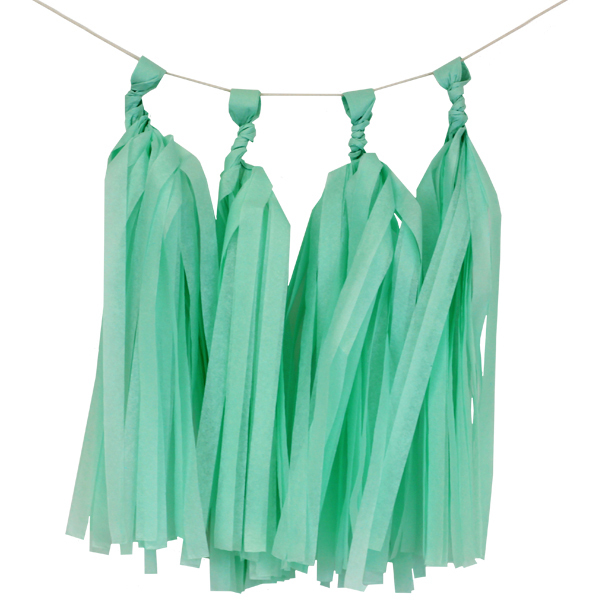 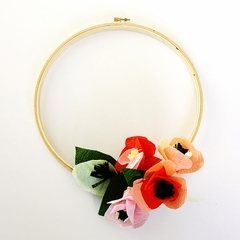 Your tissue tassel garland kit is easy to hang, and simple to assemble! 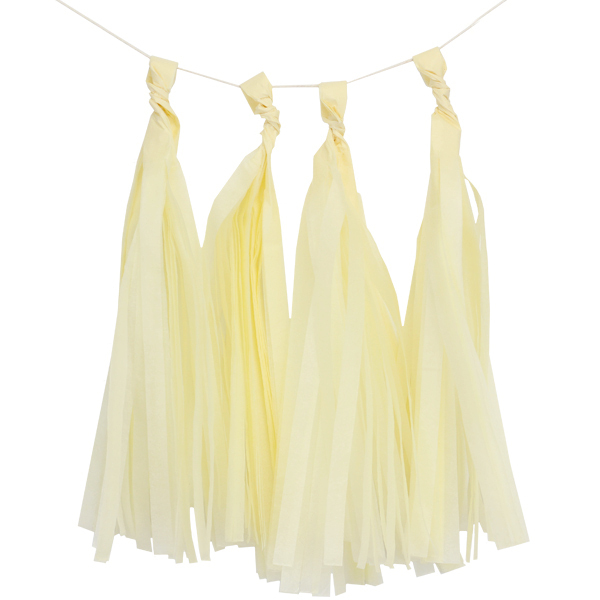 Tissue Paper Tassel Garland is the perfect mix of fringe and flair for any party d�cor. 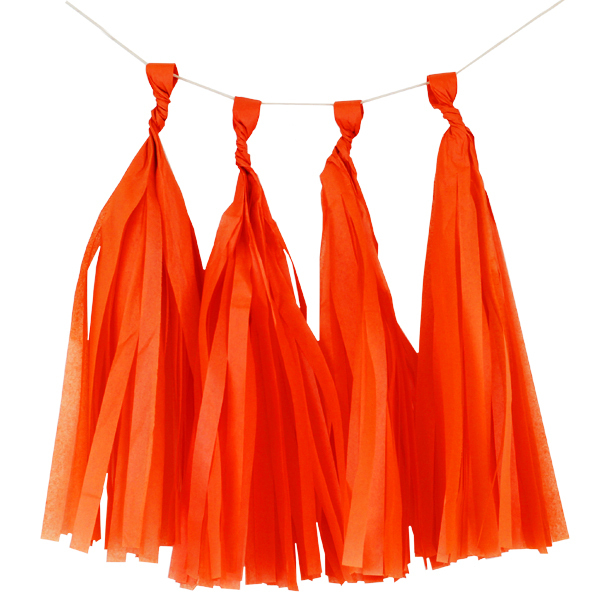 Splash your event with a pop of color and style using tissue tassels. 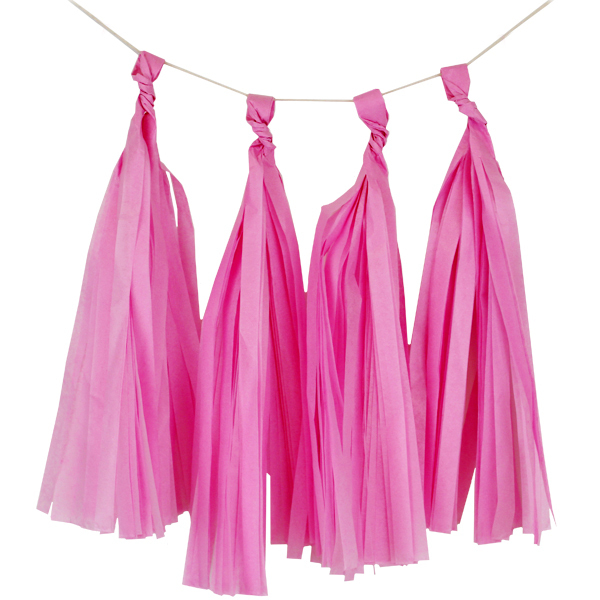 String your tassels together to create a modern garland or dangle from your jumbo round balloons and paper lanterns. 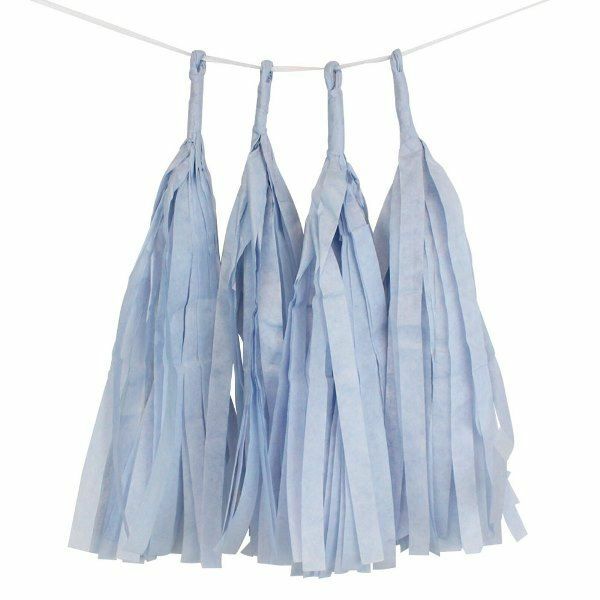 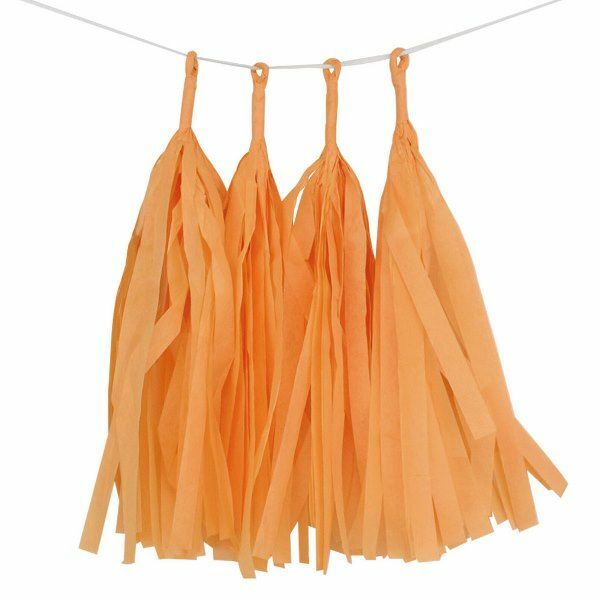 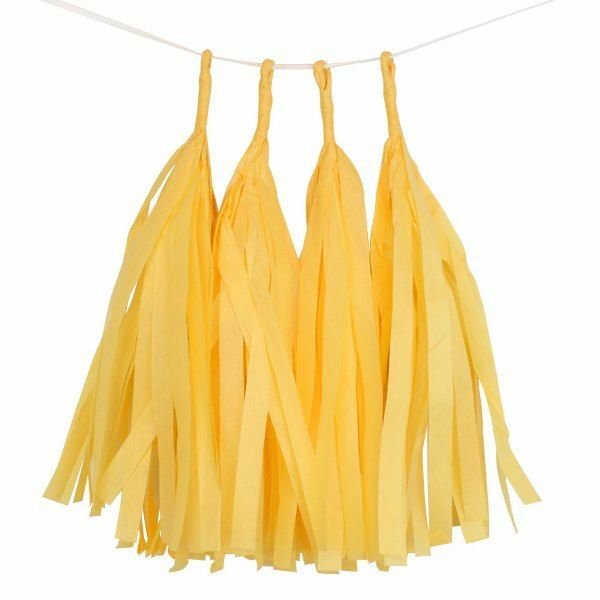 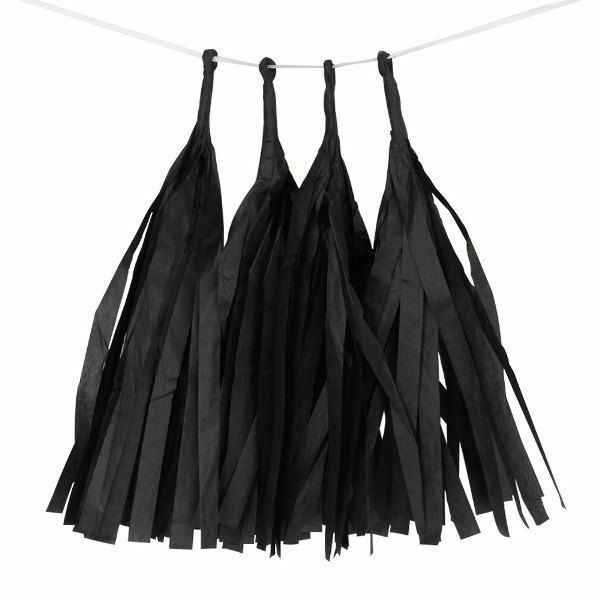 Your 16 piece tassel garland kit includes 16 tissue tassels measuring 12 inches in length, and twine string measuring 72 inches in length. 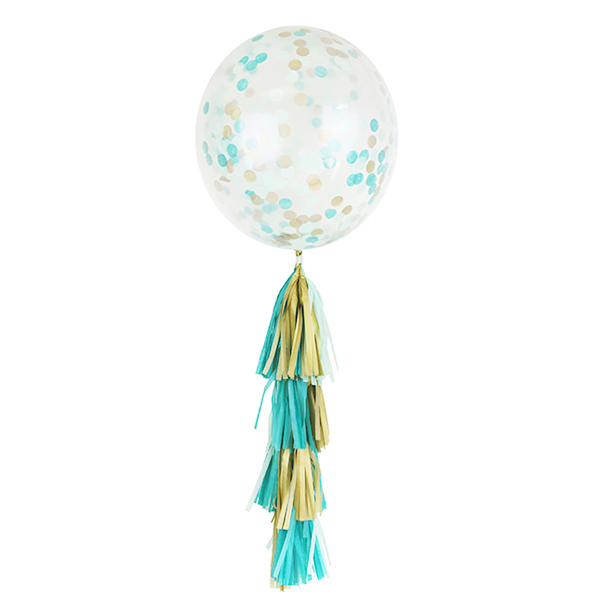 This item is great for birthday parties or baby showers, and can be accompanied with other tissue products. 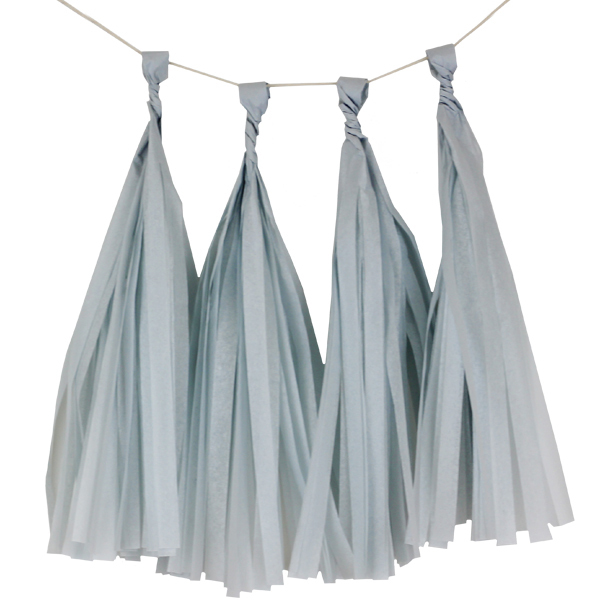 Tissue tassel garland can be hung indoors, or along fences or homes for outdoor events. 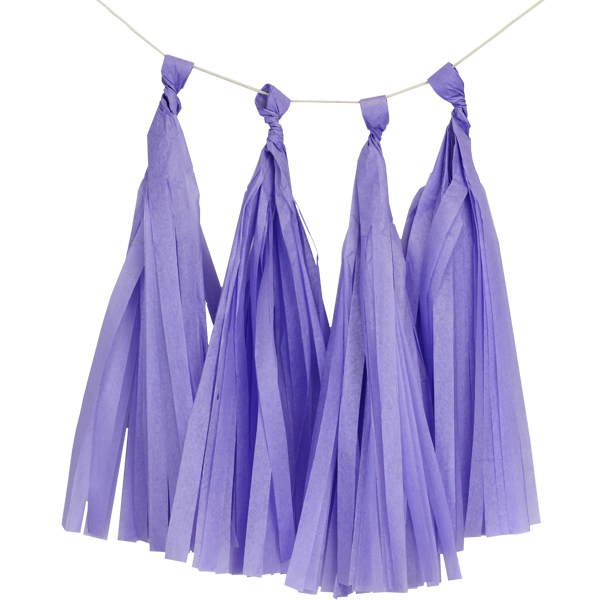 Your tissue tassel garland kit is easy to hang, and simple to assemble! 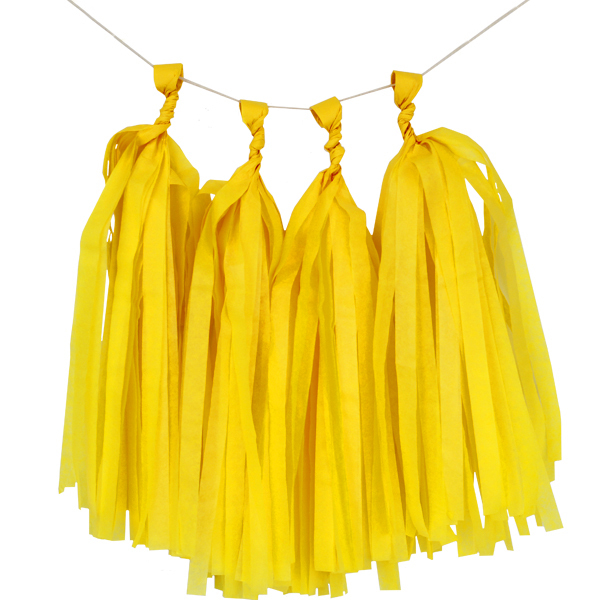 Includes 16 precut tassels ready to assemble. 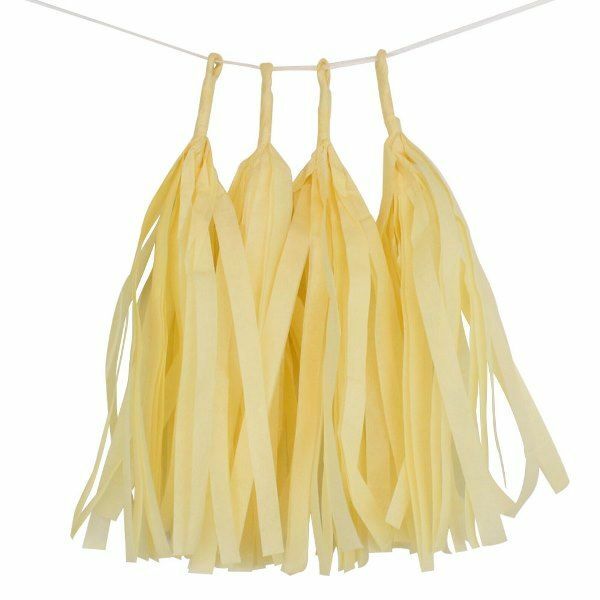 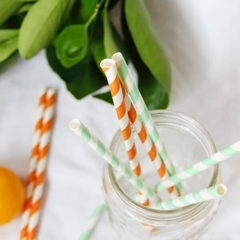 One Twine measuring 72� included. 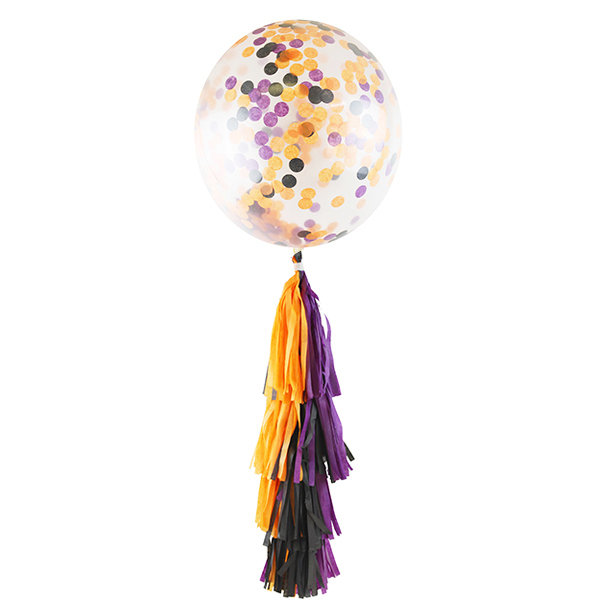 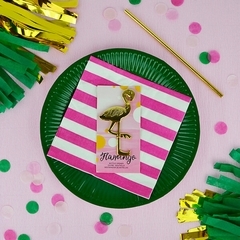 We know you love confetti, fringe and color just as much as we do, which is why we curated these themed tassel confetti balloon decorating kits for your next party. 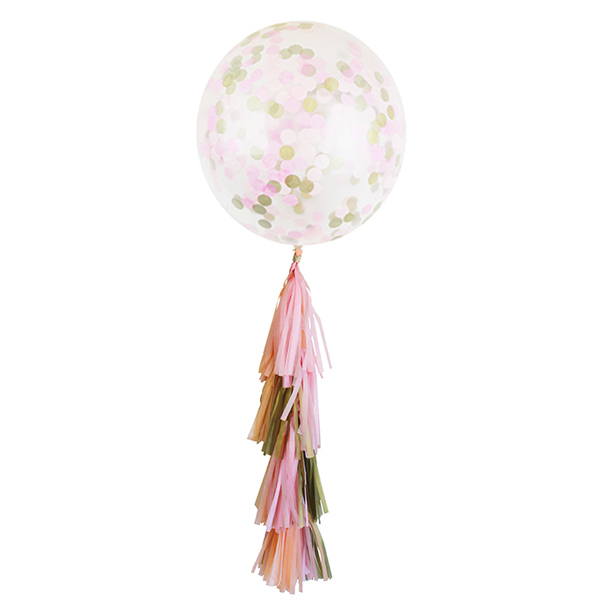 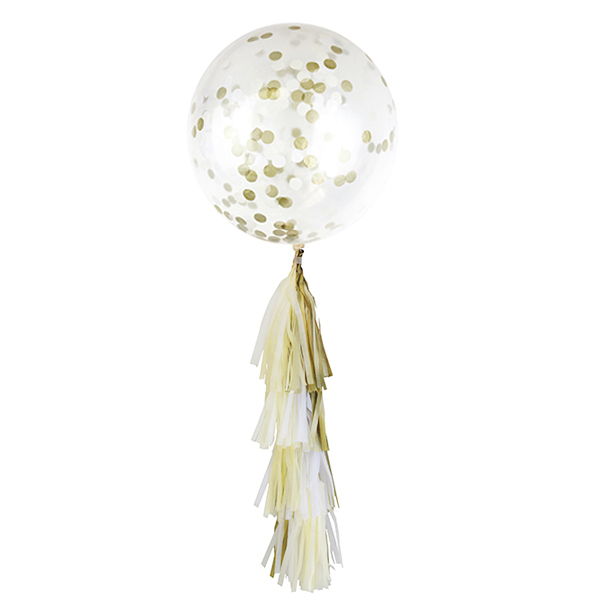 Simply fill your clear balloon with the loose tissue confetti dots, fill with helium or air, then attached your tissue tassels for extra flair. 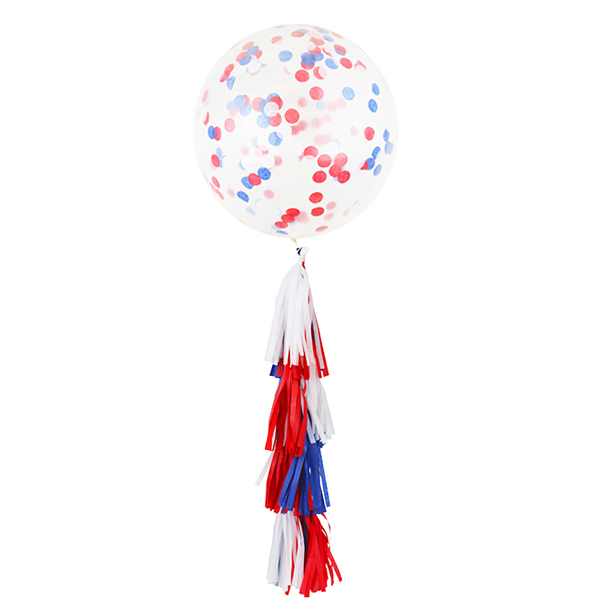 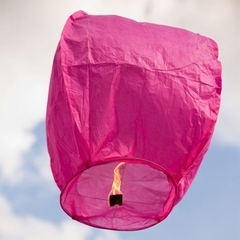 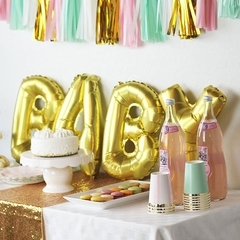 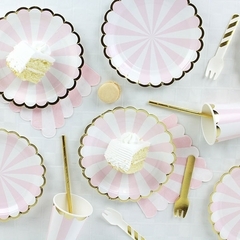 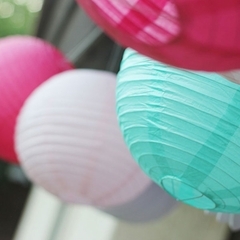 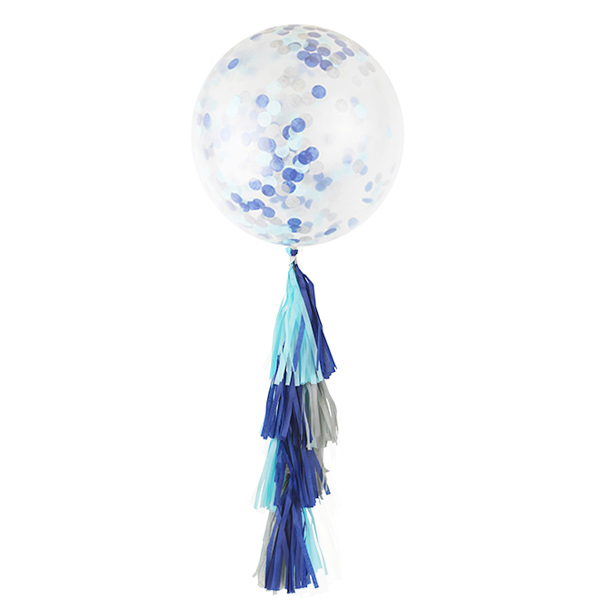 These balloon kits are sure to add a pop of color to your party decor. 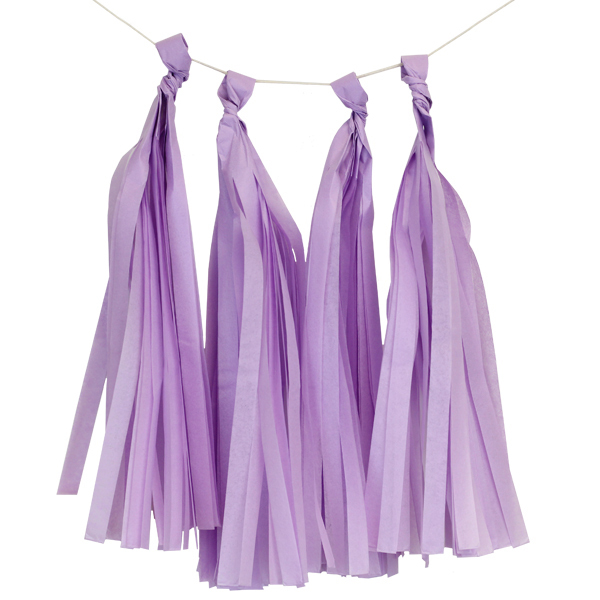 Here is the instruction how to make tissue paper tassels.